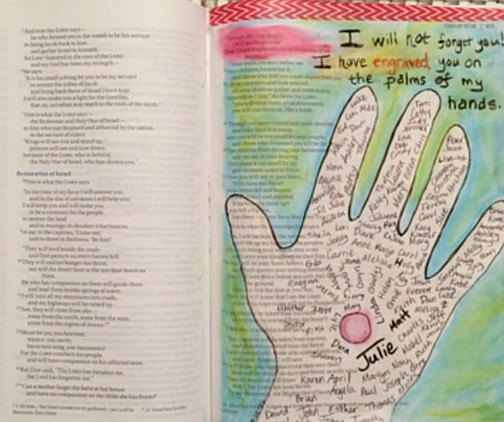 I previously blogged about my adventures into the world of Bible Art Journaling. Since my initial blog, I bought more art supplies and have been drawing/doodling on watercolor paper. My new favorite discovery: gelatos. Before, I just thought gelato was something you eat (and I love eating gelato…especially sea salt caramel gelato), but now I’ve had fun using gelatos to add color to my paper. A few days ago, I did something I never thought I would do – I bought an art journaling Bible. Since I’m someone who typically draws stick figures and labels anything I try to draw, I found a Bible that made this purchase a little less intimidating. I ended up buying a Beautiful Word edition. It already has 500 verses illustrated in color and then lots of space for you to add your own artwork/notes. Thanks to Amazon’s free same day shipping in my area, I had it in my hands that same night. It’s funny to think that as a kid, I would occasionally underline something in my Bible with pencil. Now, in my Bible I’m using watercolors, watercolor pencils, art pens, gelatos, and washi tape. Before, I was simply reading God’s word. Now, I’m interacting with it and the truths are sinking in so much deeper. Last night, I was praying and told God that sometimes I feel forgotten. He quickly brought to mind the verse, “I have engraved you on the the palms of my hands.” I then looked it up in my Bible (Isaiah 49:16) and read the verse right before that – “I will not forget you.” (Isaiah 49:15). I then pictured the hole in Jesus’ hand being surrounded by my name and the names of family members and friends. I knew that this was an image I needed to capture. Moments like these remind me that God listens to our prayers, and He wants us to be completely honest with how we feel. He also longs to encourage us. Sometimes He speaks through scripture. Sometimes He speaks through others. Sometimes He speaks through a song. And sometimes He might even speak through gelatos and watercolors. Wonderful post. So encouraging and kind.